Heat the oven to 200C. Scrub the sweet potatoes and cut into wedges. Toss in the olive oil. Place them on a roasting tray and bake for 20 – 25 minutes. Add the chorizo and the orange quarters and bake for a further 15 minutes. Remove from the oven and turn everything over with a spoon to coat the potatoes with the chorizo juice. 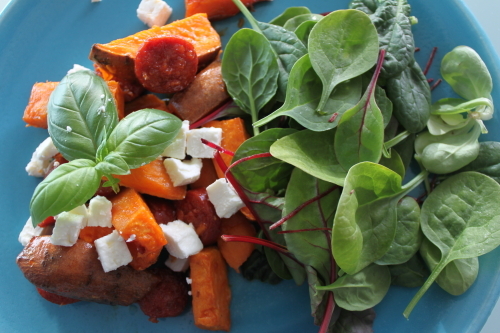 Pile the sweet potatoes and the chorizo onto serving plates and scatter with the crumbled feta. Season to taste (I omit salt as the feta is quite salty). Squeeze the juice from the warm orange pieces over the top and serve. Sounds delicious! Plan to cook this soon. Thanks for the comment Eileen. It is good and I hope you enjoy it when you cook it.